Mike Ullery | Daily Call Troy Fire Department medics check out the driver of a vehicle that crashed into a house on North Road, in Troy, on Sunday evening while firefighters and Troy police officers access the damage to the home. 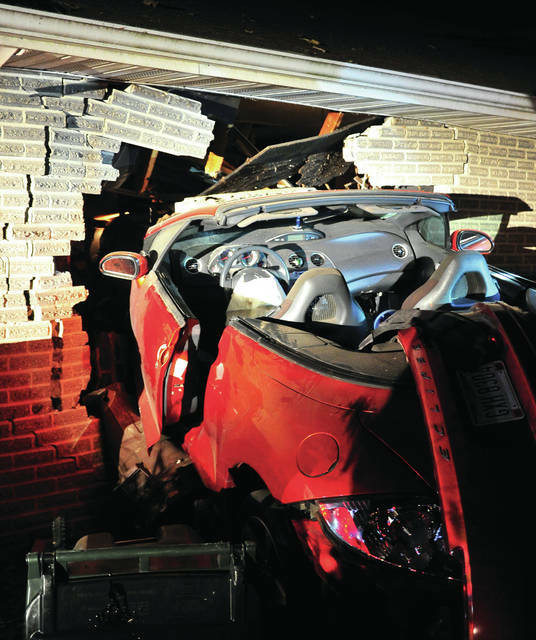 Mike Ullery | Daily Call A convertible rests partially inside a home on North Road in Troy after its driver lost control and slammed into the structure late Sunday evening. TROY — A home in Troy sustained heavy damage after being struck by a car on Sunday evening. Troy police, fire, and medics were dispatched to a home on North Road shortly after 9 p.m. on the report of a vehicle into a house. Troy police and a unit from the Miami County Sheriff’s Department arrived to find the alleged driver of the vehicle sitting in the front yard, his car crashed into the home, and coming to rest with the entire front half of the car inside the brick home. Troy police indicated that the home owner was at work at the time of the crash. No one else was home. The driver of the car was taken to Troy Fire Department medics to Upper Valley Medical Center. It is not known if he sustained any serious injuries in the crash. The vehicles air bags did deploy on impact. The driver was apparently southbound on Branford when he failed to make the turn onto North Road. He drove through a yard, narrowly missing a pair of large trees, before slamming into the home. The home appears to have sustained substantial damage from the impact. Troy police said that a charge of failure to control is pending and further charges may be filed. Police suspect that alcohol may be a contributing factor in the crash, which remains under investigation. 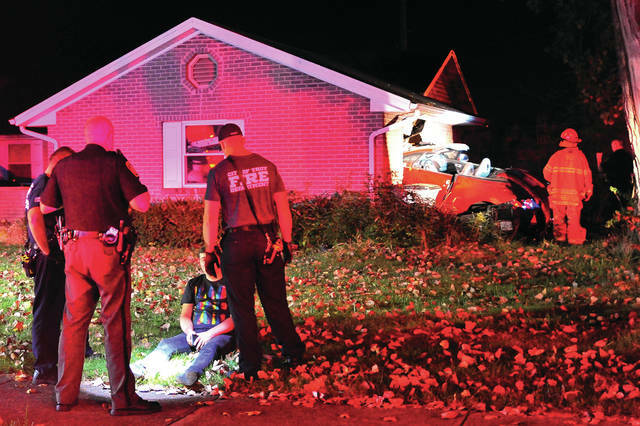 https://www.dailycall.com/wp-content/uploads/sites/30/2018/09/web1_091618mju_crash_northroad1.jpgMike Ullery | Daily Call Troy Fire Department medics check out the driver of a vehicle that crashed into a house on North Road, in Troy, on Sunday evening while firefighters and Troy police officers access the damage to the home. https://www.dailycall.com/wp-content/uploads/sites/30/2018/09/web1_091618mju_crash_northroad2.jpgMike Ullery | Daily Call A convertible rests partially inside a home on North Road in Troy after its driver lost control and slammed into the structure late Sunday evening.